I’m often asked what the thing is based on and the answer has to be that, without it’s fibreglass Landrover shaped panels, it can’t really be said to be based on any recognised road vehicle.It is called a 3M Challenger and various comp. safari car builders have apparently laid claim to the design, but what I do know is that it was designed to accept SeriesII Discovery axles and coilover suspension, all clad in fibreglass panels which made it look very similar to the ‘Tomcat’, although wider (due to axle width increase on SII Disco’s), lower due to the 3″ diameter tubular chassis rails and at the time it was longer than any available Tomcat. Please understand I’m not knocking Tomcat in any way, they’re good guys and build some nice trucks. Pod’s 2nd Tomcat was built in the same garage at the same time as the Challenger, although his was finished way before mine and there was a temptation to delve into his massive pile of ‘shiny bits’ and hide them away! At the time the garage door had Special Projects Dept. written on it in marker pen. The challenger/Buggy took a lot longer to build, just over a year really as nothing was straight forward, the main tubular chassis had the rollcage on it and nothing else. It was collected from Warwickshire on the trailer and to move it I just stood up inside it and walked into the garage wearing it like a very big hat! Light? yes . 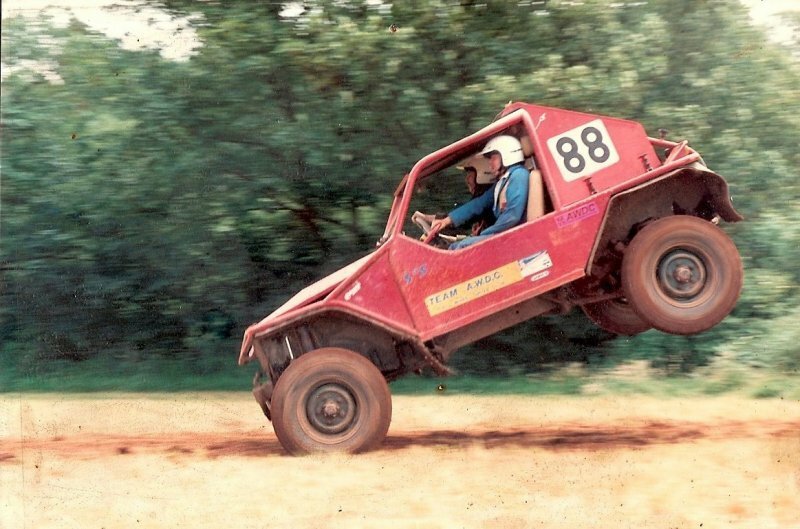 The donor vehicle was a rear engined buggy I’d built in ’95 which was quite ‘trick’ at the time but was designed around 29″ high maxicross tyres ( think they’re called aligators now?). An awful lot of this old buggy was going on the new one, and there was a plan at the time to get back into comp safari, which Pod and Shouler did (at KORC!!) and whilst at that site I came across the car I’d built and raced during 1990/91! but that’s another story. Prior to the new buggy build we’d all spent/drank our way through many different ideas but the trouble was Clarkson’s Motorworld had been on and introduced Icelandic trialing to us which was mind blowing at the time and not long after Channel 4 covered a whole season of this, the craziest motorsport on the planet. That did it for me, and when I was offered a set of 35″ Simex, I couldn’t refuse, what a very very nice man. So on went the 2 salisbury axles attached by some 10″ extended rangie front radius arms with SII Disco bushes @ about £14 each! (does that mean they are good? ), decided on coil springs and the longest shockers that pro-comp do because coilovers were too expensive and still are. Could always go to those later, and still could. 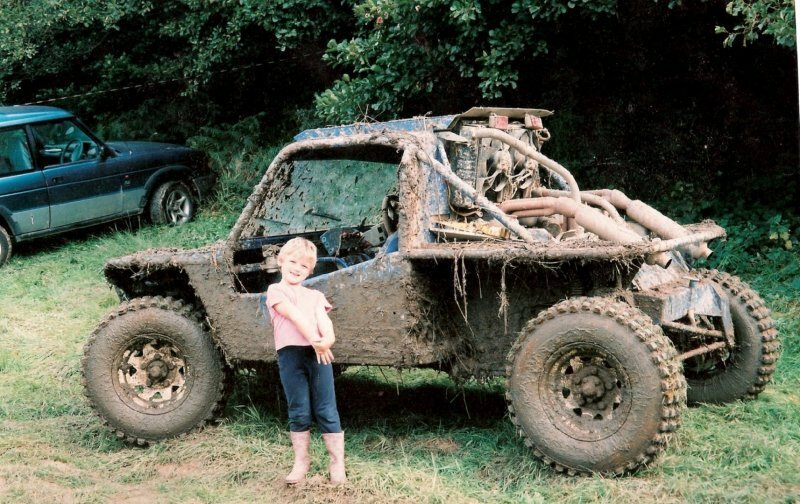 The Chevy 5.7 litre lump went in easily as did the old 4 speed manual but where the radiator used to live above the engine, I wanted to be able to look out rearwards so had no choice but mount it in the front where it’s likely to fill up with mud etc. I took the option though of moving the rad. way back towards the bulkhead and this does work ok. By this time the frame had been sprayed a crazy green/yellow colour and I still cannot say WHY. Paneling was/is fairly minimal and whilst I spent loads of time at the front, the back end was very rushed and still is temporary. Since starting to run Chevy’s in 1990, the current one is No,4 and was built by a mate (a very clever mate) and is balanced etc but has a fast road cam in it, it does shift given the chance! No.5 engine is in the garage with forged pistons and roller this and that all stuffed into a ’69 corvette block. The auto box which went in this summer was a revelation, wow good to drive or what?? I said this was going to go on a bit, future plans are full hydro steering, painting, beadlocks and re-tube the backend where it’s all bent. The good thing about the whole buggy is that it works ok superslow trialingwise, handles sideslopes really well, twists up ok and can really climb but also has quite a good escape button! !